Color blindness (color vision deficiency) is a condition in which certain colors cannot be detected. There are two types of color vision difficulties: inherited (congenital) problems that you have at birth, and problems that develop later in life. People born with color vision problems are unaware what they see is different from what others see unless it is pointed out to them. People with acquired color vision problems are aware that something has gone wrong with their color perception. Congenital color vision defects usually pass from mother to son. These defects are due to partial or complete lack of the light-sensitive photoreceptors (cones) in the retina, the layer of light-sensitive nerve cells lining the back of the eye. Cones distinguish the colors red, green and blue through visual pigment present in the normal human eye. Problems with color vision occur when the amount of pigment per cone is reduced or one or more of the three cone systems are absent. This limits the ability to distinguish between greens and reds, and occasionally blues. It involves both eyes equally and remains stable throughout life. There are different degrees of color blindness. Some people with mild color deficiencies can see colors normally in good light but have difficulty in dim light. Others can't distinguish certain colors in any light. In the most severe form of color blindness everything is seen in shades of gray. Except in the most severe form, color blindness does not affect the sharpness of vision at all. It does not correlate with low intelligence or learning disabilities. Most color vision problems that occur later in life are a result of disease, trauma, toxic effects from drugs, metabolic disease, or vascular disease. Color vision defects from disease are less understood than congenital color vision problems. There is often uneven involvement of the eyes and the color vision defect will usually be progressive. 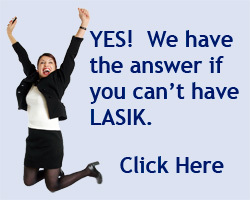 Acquired color vision loss can be the result of damage to the retina or optic nerve. There is no treatment for color blindness. It usually does not cause any significant disability. It can, however, prevent employment in an increasing number of occupations. Change in color vision can signify a more serious condition. Anyone who experiences a significant change in color perception should see an ophthalmologist.